Garrison Inn rooms feature reclaimed woods, luxurious linens, sumptuous upholstery along with framed ephemera and historic hotel silver that give each guestroom a feeling of warmth and integrity; while prominent retained architectural elements such as working fireplaces, exposed brick walls, hand hewn beams, wood paneled window shutters and wall moldings highlight the grandeur and exclusivity our historical landmark. 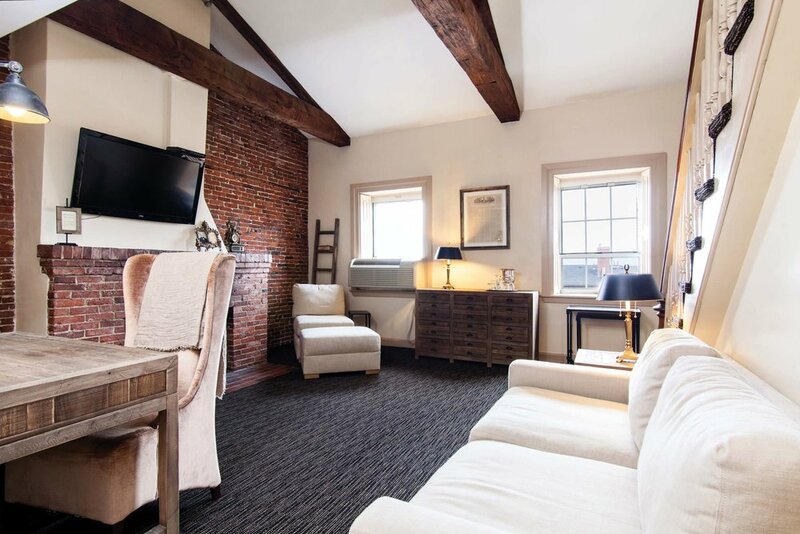 Inspired by William Lloyd Garrison, editor of the abolitionist newspaper The Liberator, our 24 hotel rooms merge the industrial look of the newspaper letterpress workshop with modern streamlined design; perfectly integrated into the original National Historic Landmark structure. Reclaimed woods, luxurious linens, sumptuous upholstery along with framed ephemera and historic hotel silver give each guestroom a feeling of warmth and integrity; while prominent retained architectural elements such as working fireplaces, exposed brick walls, hand hewn beams, wood paneled window shutters and wall moldings highlight the grandeur and exclusivity our historical landmark. A unique two story, one-bedroom suite. The first floor features a living room with working wood burning fireplace, sofa, lounge chair with ottoman, sideboard table, writing desk. Bathroom is located on the first floor. A traditional staircase leads to a second floor featuring a King bedroom with sitting area. Approximately 565 square feet. A one-of-a-kind two-story, two-bedroom duplex. The first floor features a living room with working wood burning fireplace, sofa, lounge chair with ottoman, sideboard table, writing desk. Bathroom is located on the first floor. A traditional staircase leads to a second floor featuring two bedrooms; a semi-private bedroom offering two Twin beds with a sitting area, and a second private bedroom with one Queen bed. Approximately 715 square feet. working wood burning fireplace, fifteen-foot cathedral ceilings, original hand hewn beams, exposed brick. Two levels with two semi-private bedrooms. The master bedroom on the first floor features a Double bed, lounge chairs and writing desk. Bathroom is located on the first level. A spiral staircase leads to the second floor bedroom loft with one Double bed. Approximately 440 square feet. Two levels with two semi-private bedrooms. The master bedroom on the first floor features a Queen bed, lounge chairs and writing desk. The bathroom is located on the first level. A spiral staircase leads to the second floor bedroom loft with two Twin beds. Approximately 440 square feet. 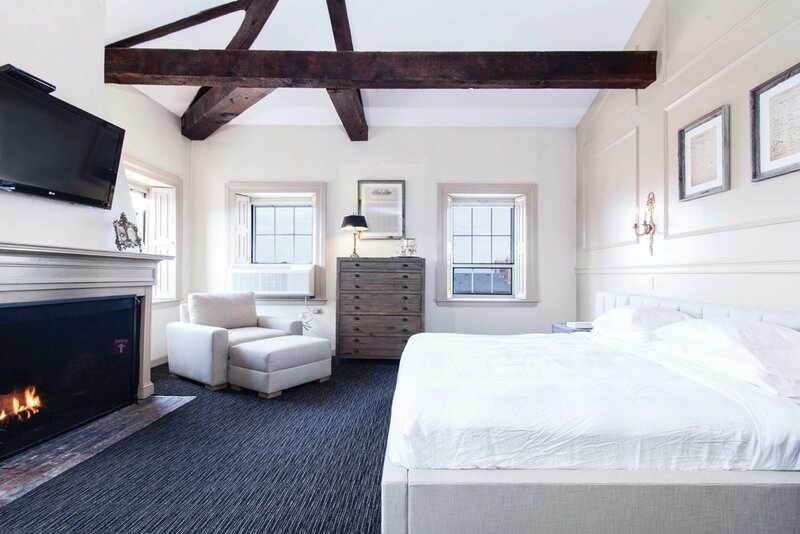 King bed, working wood burning fireplace, oversized arm chair and ottoman, writing desk, view of Brown Square Park. Approximately 390 square feet. 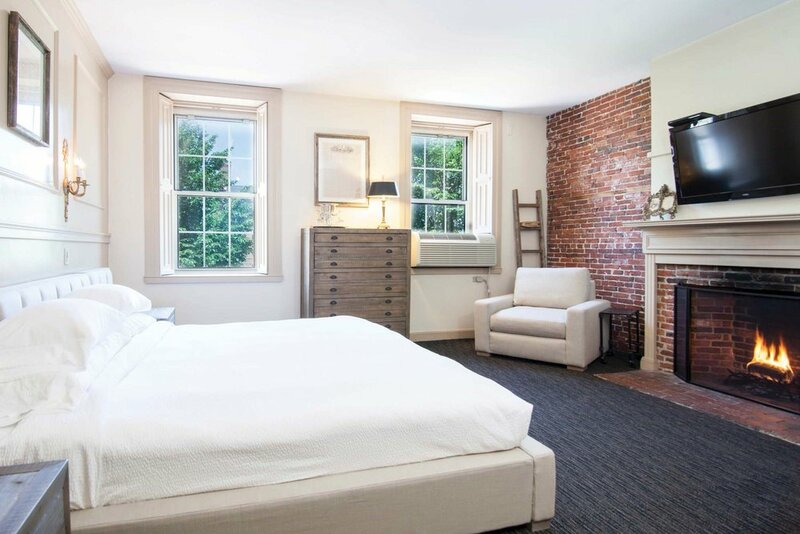 King bed, working wood burning fireplace, oversized arm chair, writing desk, view of Brown Square Park. Approximately 345 square feet. King bed, oversized arm chair, writing desk, view of Brown Square Park. Approximately 345 square feet. King bed, lounge chairs, writing desk. Approximately 345 square feet. Queen bed, lounge chair, writing desk. Approximately 250 square feet.